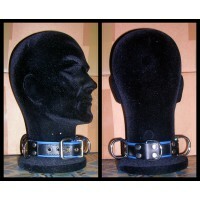 Leather collar with centred o-ring. High quality leather Dog Collar with stripe, available in black, or with coloured edges. 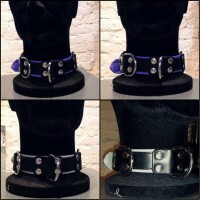 In the same..
High quality leathers Slave Collar with metal D-rings, available in black, or with coloured edges. I..
High quality leather Collar with stripe, now in two fresh new colours guaranteed to make you stand o..
High quality leathers Slave Collar with metal D-rings, now in two fresh new colours guaranteed to ma..
Sparta's Bull Dog Harness, in black or tri-couleurs French..